Acuity understood early on that they weren’t marketers, nor were they ever going to become one! They knew hiring an internal team wouldn’t be cost effective, so they needed an outsourced team with previous experience. Acuity tried several different marketing consultants, but none of them had the industry knowledge they wanted. 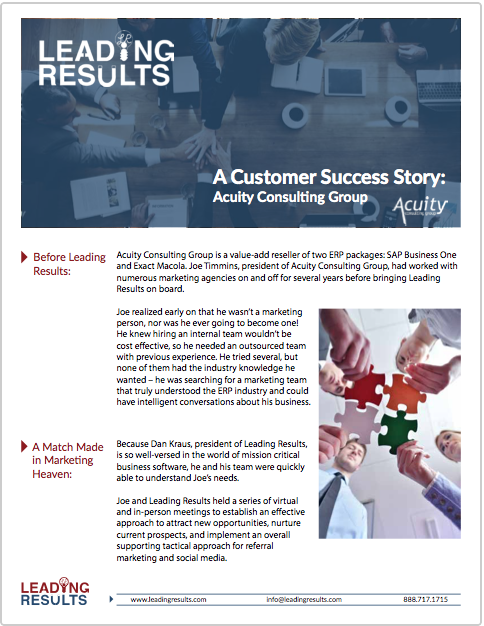 Acuity was searching for a marketing team that truly understood the ERP industry and could have intelligent conversations about his business. Because Leading Results is so well-versed in the world of mission critical business software, the team was quickly able to understand Acuity’s needs. Through a series of virtual and in-person meetings, Acuity and Leading Results established an effective approach to attract new opportunities, nurture current prospects, and implement an overall supporting tactical approach for referral marketing and social media. Leading Results helps businesses stop wasting money on marketing and improves their business development results by putting POWER in their marketing. The POWER is the Processes, Organizational Support, Why (you do what you do), Expertise and Refer-ability. You get strategy, tactics and execution. We work with both individual businesses and businesses as part of a larger ecosystem. Be more profitable. © 2016 Leading Results, Inc.